Whatever you call these mini vegetable pancakes, there is no denial, – they taste great and always go fast. 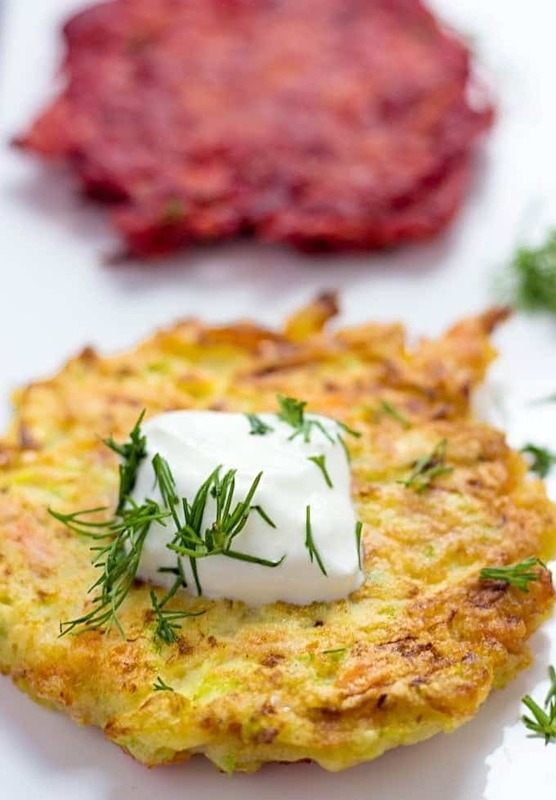 Vegetable fritters are extremely popular in Ukraine. I basically grew up eating them. Without a doubt, most popular are potato fritters. We call them “deruny” and any homemaker has her own twist on the recipe. My husband is a big fan of them. 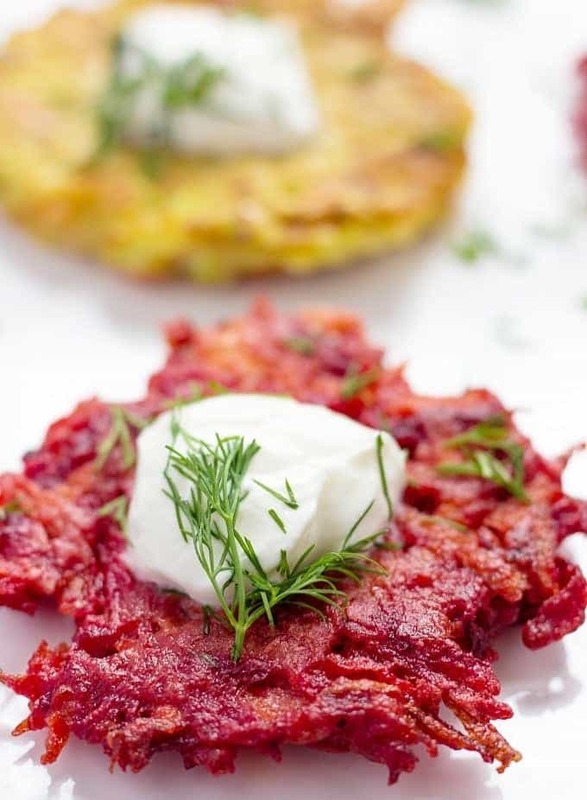 Beet fritters, on the other hand, – is something, that I’ve never tried before. We mainly consume beets in a borsch or beet salad. 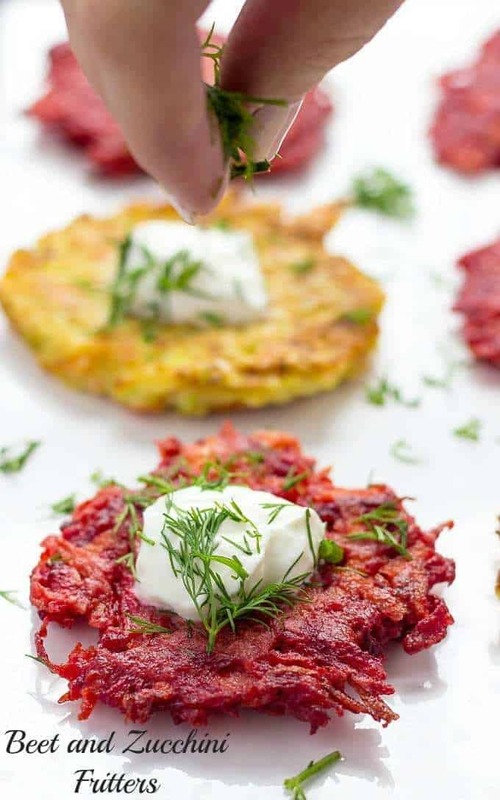 But since I love experimenting with ingredients and after I made a very delicious Scandinavian Beetroot Tart with Feta Cheese, I decided to give beet fritters a try. To my greatest joy, these didn’t disappoint me. 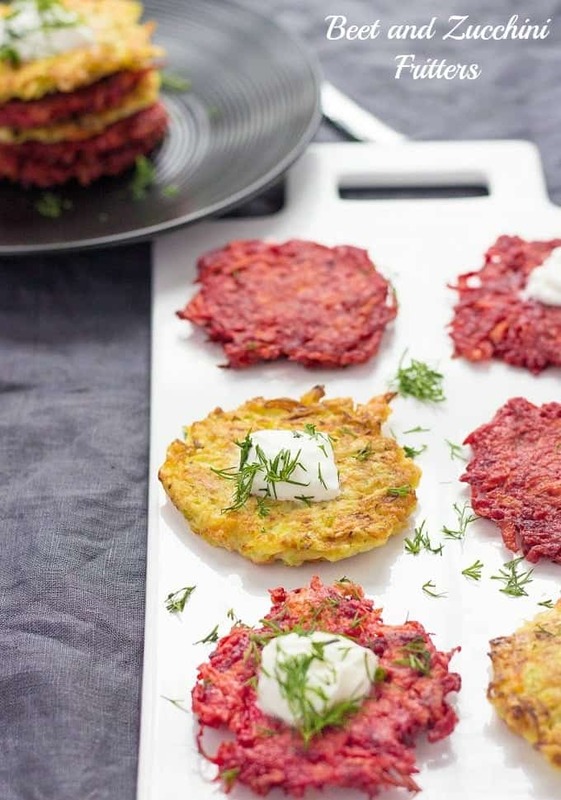 As with regular potato fritters or latkes (whatever you want to call them), beet fritters take little time to prepare. They are delicious, healthy and you’ll most likely be making them again. As with potato fritters, zucchini ones are also classic. Regardless of how many fritters you make, be sure, they’ll go really fast. So, today I’m giving you two recipes in one post. They are very easy and your family can enjoy these fritters as a side dish for lunch or dinner. Or actually let me tell you, I usually make a big batch of these fritters and we eat them as a vegetarian main dish. In a medium bowl combine all ingredients and mix well. In a large non-stick skillet, heat 3-4 tablespoons of vegetable oil and drop a spoonful of batter. Gently press on the fritter with a back of the spoon to make them flatter. Cook on a medium heat for 3-4 minutes on each side. If fritters absorb all oil, you can add more along the way. Transfer beet fritters onto a paper towel. Serve with a dollop of sour cream and chopped dill. Put shredded zucchini in a sieve over a bowl and squeeze with your hands to remove as much water as possible. In a medium bowl combine all ingredients for zucchini fritters and mix well. In a large non-stick skillet, heat 3-4 tablespoons of vegetable oil and drop a spoonful of batter onto a skillet. Gently press on the fritter with a back of the spoon to make them flatter. My apologies! I might have missed a line. For zucchini fritters, you need 3 tablespoons of flour. I added this to a recipe card as well.